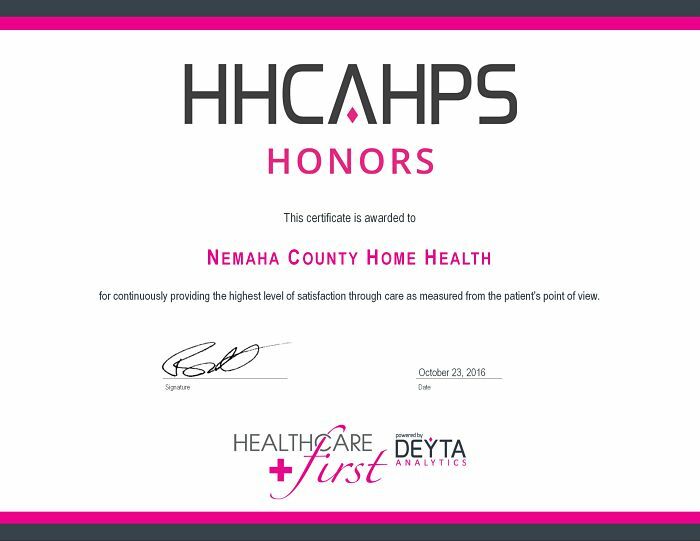 Sabetha, KS, October 23, 2016 - Nemaha County Home Health & Hospice has been named a 2016 HHCAHPS Honors recipient by HEALTHCAREfirst, a leading provider of Web-based home health and hospice software, billing and coding services, and advanced analytics. HHCAHPS Honors is a prestigious award recognizing home health agencies that continuously provide quality care as measured from the patient's point of view. It acknowledges the highest performing agencies by analyzing the performance of Home Health Consumer Assessment of Healthcare Providers and Systems (HHCAHPS) satisfaction measures. Developed by Deyta Analytics, a division of HEALTHCAREfirst, HHCAHPS Honors acknowledges the highest performing agencies by first analyzing performance on Question 25 - Willingness to Recommend as a qualifier and then analyzing performance on 18 other questions that comprise the publicly reported measures over a twelve-month period. HHCAHPS Honors recipients include those agencies scoring above the HEALTHCAREfirst National Average on at least 85% of the evaluated questions. HEALTHCAREfirst holds a special recognition, HHCAHPS Honors Elite, to honor home health agencies scoring above the HEALTHCAREfirst National Average on 100% of the evaluated questions. "We are honored to be partnered with these top-performing home health agencies who are dedicated to providing quality patient care. HHCAHPS Honors defines a standard of excellence in the home health patient experience," said Bobby Robertson, President and CEO of HEALTHCAREfirst. Nemaha County Home Health & Hospice, Patricia Remmers, CHCE, credits the staff who are committed to providing the best care possible and to assist every patient in achieving their desired outcome. She states, "Our mission is Caring for patients and families ~ one life at a time and our staff personifies our mission." Nemaha County Home Health & Hospice is a wholly owned department of Sabetha Community Hospital providing health services where ever the patient calls home. HEALTHCAREfirst provides cloud based technologies and services to improve business and clinical operations for over four thousand home health and hospice providers across the United States. Based in Springfield, MO and one of the fastest growing providers of its kind, the company provides agency and clinical management software, revenue cycle management services (billing, coding and chart audits), and cloud based "Deyta" analytics and program management solutions, in any combination. HEALTHCAREfirst's breadth of solutions offers agencies a single source to improve patient care, create operational efficiencies, increase profitability and simplify CMS compliance. With HEALTHCAREfirst, agencies can focus on patients instead of paperwork. For more information, call 800.841.6095 or visit the company's website at www.healthcarefirst.com.